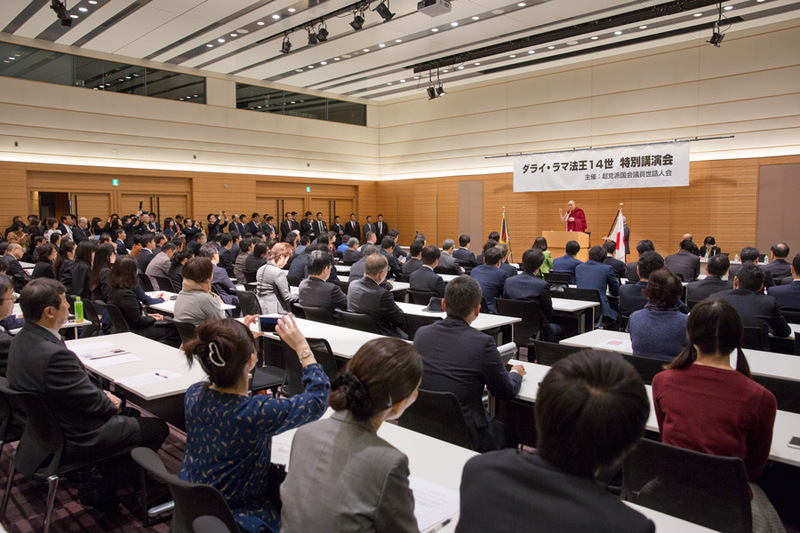 (TibetanReview.net, Nov18, 2016) – The Dalai Lama on Nov 16 addressed more 200 lawmakers in the House of Representatives of the Japanese Parliament, the Diet. The lawmakers belonged to different political parties and were members of the Japan-Tibet Parliament Group. It was the third time the exiled spiritual leader of Tibet addressed Japanese parliamentarians officially, and, according to a speech from one, each time saw more and more people in attendance, said a Dalailama.com report Nov 16. He was earlier welcomed at the gleaming, glassy, nine-storey Front Office Building of the Japanese House of Representatives, located in the heart of skyscraper Tokyo, by loud applauses from a large group of politicians belonging to five diverse political parties. The report said Japanese politicians who opened the event spoke about how the Tibetan leader had touched their hearts and how Japan as a whole could and should work to help bring peace to the world and to think about religion and humanity. He explained that the Tibetan issue was not just political but also about the preservation of Tibetan culture, language and the environment. Before the parliament event, the Dalai Lama addressed students at the Setagaya Junior High School in Tokyo which had Tibetan flags flying on every side for the occasion. He also answered questions from students on a range of issues during the two-hour event.